Fusarium wilt of watermelon is caused by the fungus Fusarium oxysporum f. sp. niveum (F. oxysporum). This disease affects only susceptible watermelon cultivars. The fungus invades the vascular tissue through the root system, which can cause wilting of the whole plant. 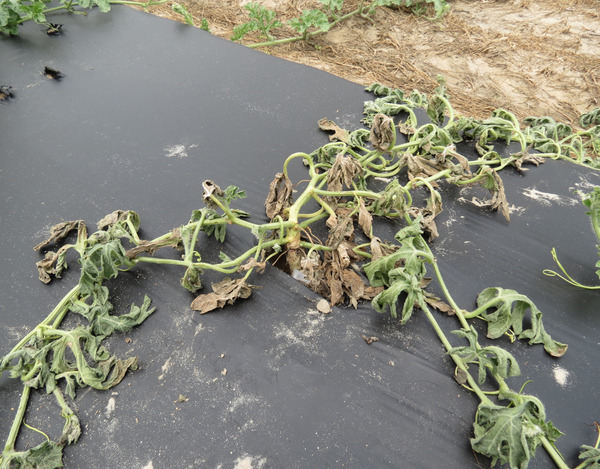 Fusarium wilt causes wilting of the aboveground tissue and general vine decline. Typically, one side of the plant will exhibit more severe symptoms than the other (Figure 1), which is known as unilateral wilting (Figure 4). The fungus colonizes the vasculature in the root and crown, and cutting open the crown can show brown streaking within the xylem (Figure 2). Fusarium wilt is a patchy disease and will cause disease in plants that appear to be randomly scattered around the field (Figure 3). Figure 1. Wilting of the aboveground tissue. All leaves are wilted or necrotic. Figure 2. Brown streaking in the xylem tissue. Figure 3. 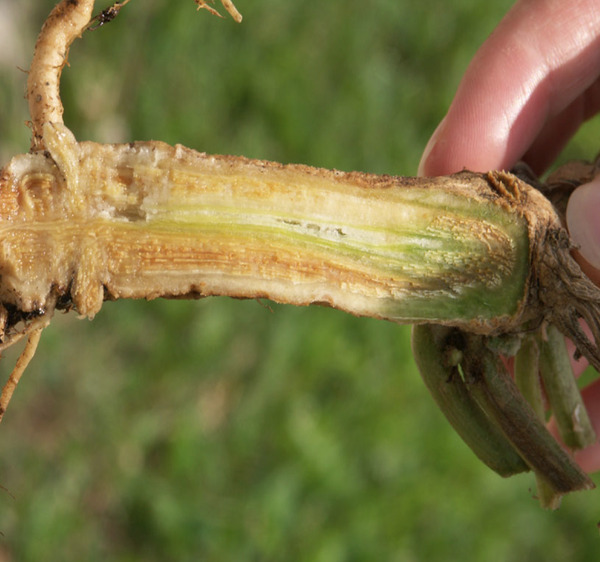 Fusarium wilt is a patchy disease and healthy plants can be found in between diseased plants. Figure 4. Unilateral wilting of single, green vines due to Fusarium wilt. Verticillium wilt of watermelon, caused by Verticillium dahliae has similar symptoms to Fusarium wilt of watermelon. These two diseases both present unilateral wilting, and cannot be distinguished in the field. Both diseases also cause the same dark brown staining of the vascular tissue. The causal agent must be isolated from the infected tissue to discern which pathogen is causing the disease. 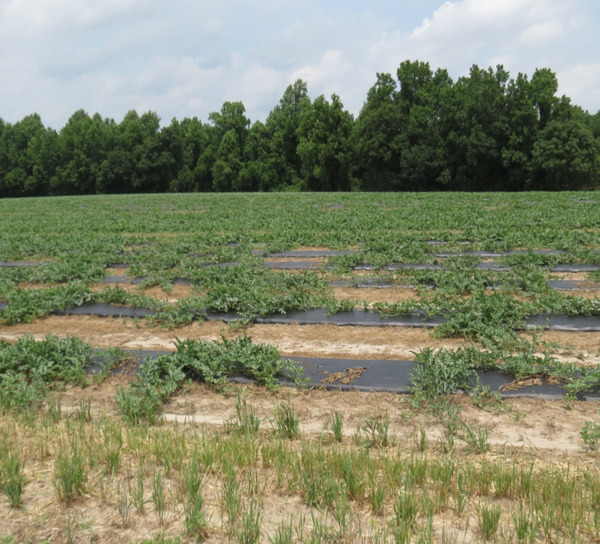 Verticillium wilt of watermelon is not common in North Carolina. Bacterial wilt of cucurbits also exhibits wilting that begins in only a few leaves. This disease is caused by the bacterium Erwinia tracheifila. When the stem is cut, a white bacterial ooze will often come out of the stem, which does not happen in Fusarium wilt. The disease is favored by cool wet conditions in the spring when infection occurs, but symptoms are observed during the hot and dry conditions in the summer. The pathogen infects in the cool and wet weather when the plants are young and overtakes the vasculature. Hot and dry summer temperatures can stress the plant and cause the wilting symptoms that are typical for the disease. Fusarium oxysporum is a soilborne fungus not transported on air currents. The pathogen can be transported long distances in infected plant tissue, infested soil from transplants, or seed. It is recommended that certified clean seed is utilized in the field. The fungus can create survival spores that will live in the soil for many years (5-10). Flooding in the field can also serve to spread inoculum within a localized area. 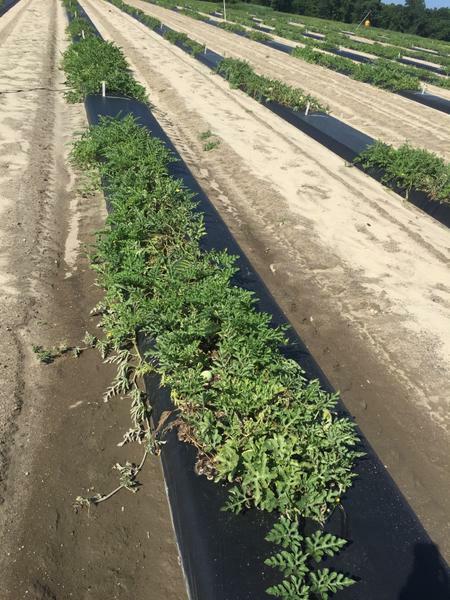 Plant resistant varieties of watermelon if the field has a history of Fusarium wilt. Rotate crops away from watermelon for 5-10 years if disease is found in the field. Use good sanitation practices (removal of infected plant tissue away from the field site, using clean equipment, etc.). Plant watermelons in raised beds with plastic mulch. Few fungicides are available for Fusarium wilt control, but a soil application at transplant with prothioconazole (Proline 480 SC) can reduce disease in the field. For the latest fungicide recommendations for Fusarium wilt of watermelon see the Southeastern US Vegetable Crop Handbook. Fungicide labels are legal documents, always read and follow fungicide labels. Organic growers have no chemical control options that are effective and need to completely rely on host resistance and cultural strategies for disease control. Home gardeners have no chemical control options that are effective and need to completely rely on host resistance and cultural strategies for disease control.